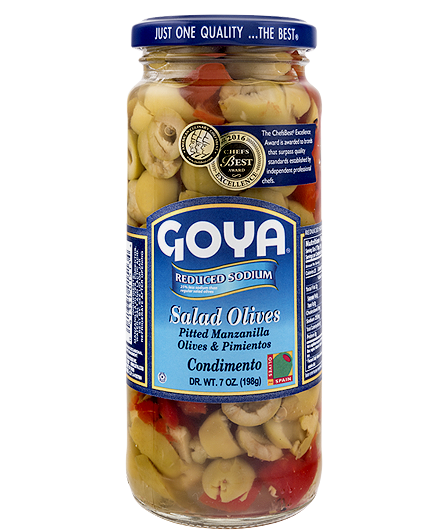 With a smooth texture on the outside and meaty pulp inside, GOYA® Green Olives exquisite taste will surprise you. 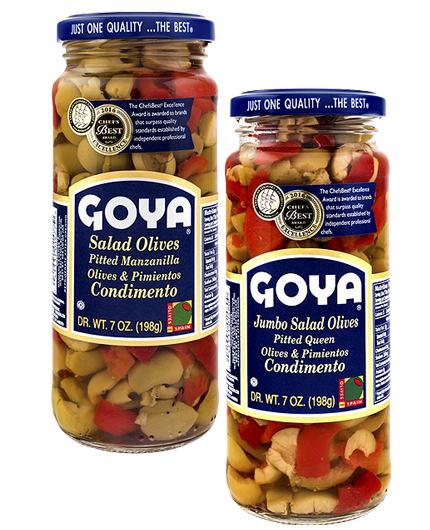 The rigorous specifications that we here at Goya Spain establish when selecting only top-qualite olives make them the most select olives in existence on the market. 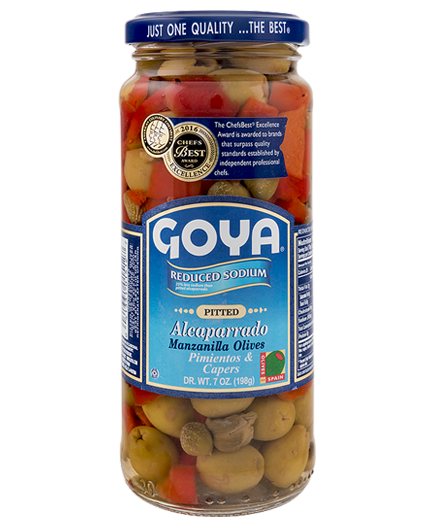 Excellent ingredients for adding to chicken and fish stews (hake and cod), salads, cold dishes, Russian salad or to accompany some delicious pickled anchovies. 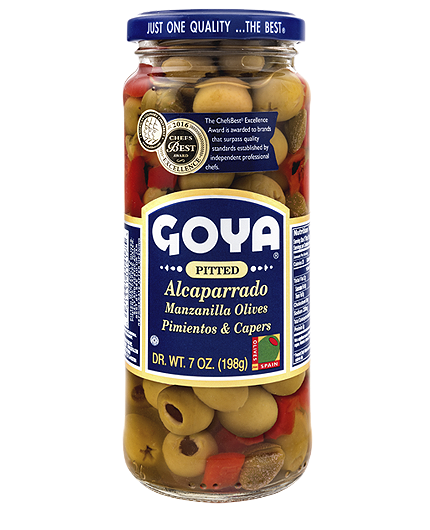 Great for preparing tapenade or focaccias, dressed with olives and olive oil. 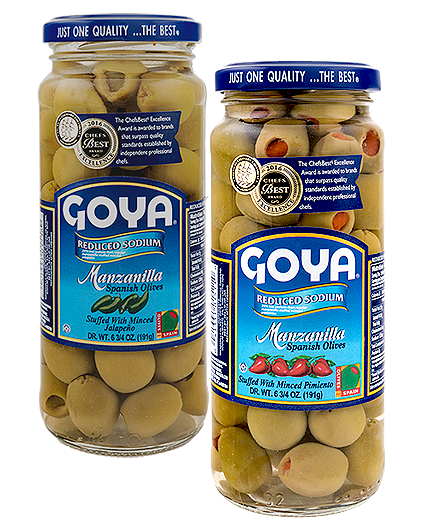 To prevent any damage to the fruit, GOYA® Green Olives are hand-picked in the veraison stage, at the beginning of their ripening period (between September and October). 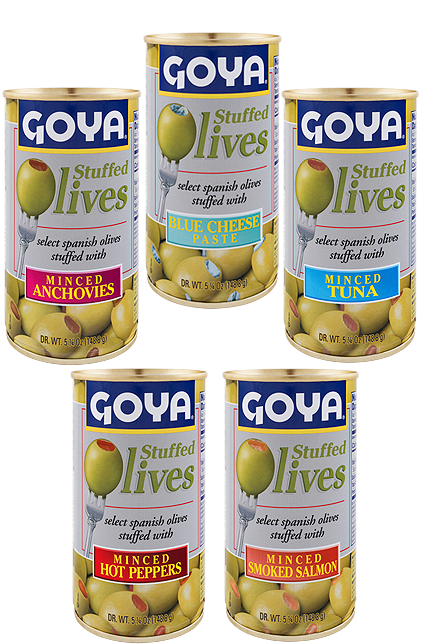 The olives cannot be eaten directly from the tree, so they first undergo a treatment to eliminate their bitterness. Then, we store them in brine. 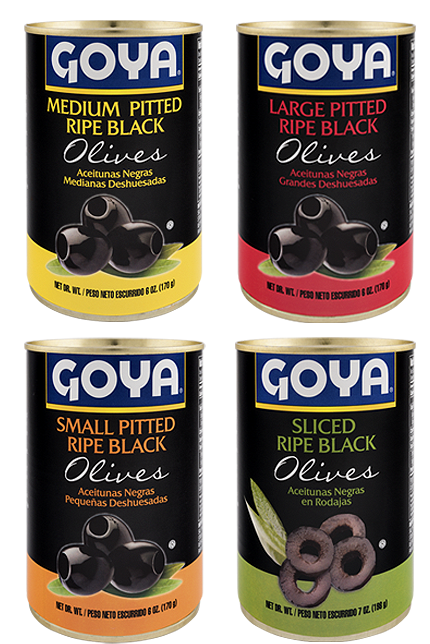 At that moment, recently-harvested and rich in sugars, they begin a natural process during which they start to become oil, giving the olive its authentic flavor. This process is referred to as “Seville Style”. Now, they are ready for packaging. 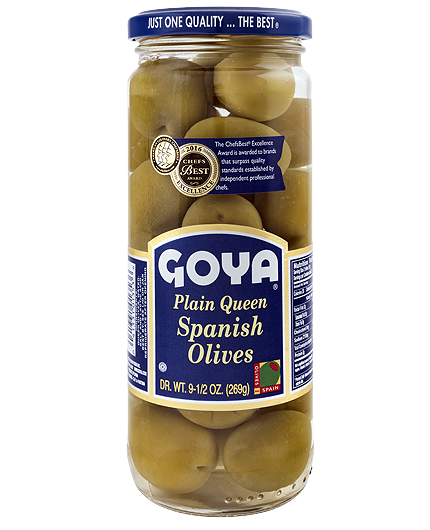 Among the different kinds of GOYA® Green Olives, we have the Queen olives (Gordal variety), large andheart-shaped, available both pitted and stuffed. 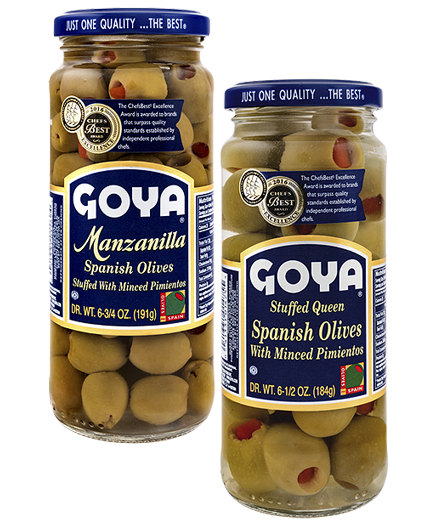 Manzanilla variety GOYA® Green Olives are smaller in size: characteristic of Sevillian olive groves, it is a generous and tasty olive. 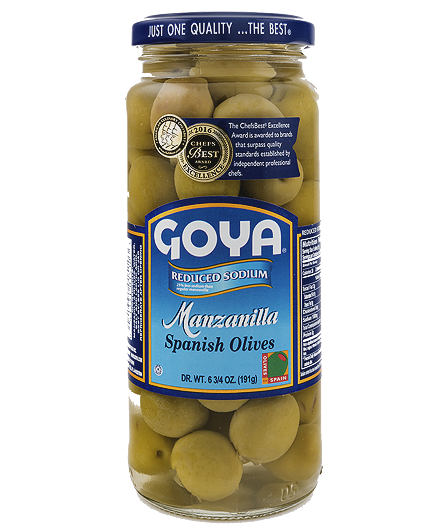 Goya Spain packages its manzanilla green olives whole, pitted and sliced. 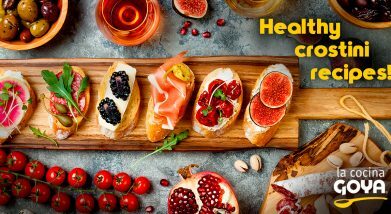 At Goya Spain we carry out exhaustive controls to guarantee that all of our products and ingredients are free of pesticides. 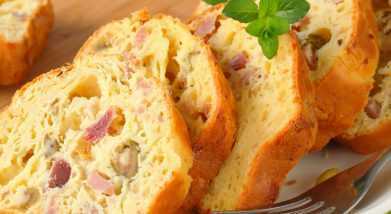 Green olive, Bacon & Cheese Bread Recipe!Elaboration:In the numerous variations on this savory dish, GOYA® Green Olives, which we add sliced to the mixture, add an extra touch of flavor when combined with the bacon. 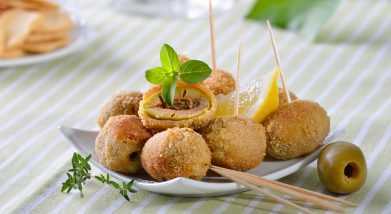 Fried Green OlivesElaboration:GOYA® Green Olives, egg and bread crumbs are the basic ingredients for this appetizer.